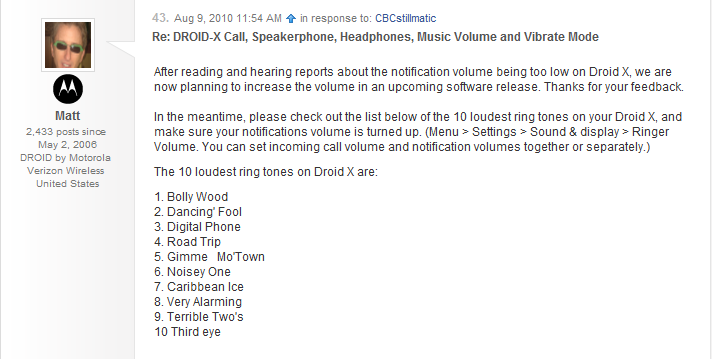 Droid X users, you have been heard! There has been a widely reported volume issue for both the ringer and speakerphone of the DX and Motorola has announced today that a fix is coming. They would only admit to a volume increase coming in an “upcoming software release” which we can assume means Froyo, but no date was included. Maybe the 1,800+ Droid Life readers who responded to this poll of ours had something to do with it? We’d sure like to think so. While Moto seems to be standing strong on the locked bootloader issue, you have to admit that it’s pretty refreshing to see a company listen to their customers and then respond in a positive way. +1 Moto?